A short while ago, I rewatched the Divergent film with a friend, and I guess seeing Theo James's face and knowing that Insurgent was coming out soon had me in the perfect mood to read this novella set. Either way, it worked out fine, because more Four is always a good thing, right? Right. So there are four different novellas relating Four's experiences, and then at the end there are three additional, exclusive scenes that are pretty much the best parts of the book. I'll just give you guys a run down of how I felt about each part. The Transfer. I actually read this novella when it came out separately as just an ebook in 2013. To be honest, I skipped right over it rather than re-reading it a second time. Still, even in 2013 I was eager for more Four, and it was really interesting getting to see how Four's first experience in Dauntless differed from Tris's. The Initiate. Again, in this story, we get to see how much different Four had it in Dauntless than Tris did. In fact, he had it much easier considering there was no getting kicked out and becoming factionless at the time. I didn't find this story particularly appealing, though Four was a completely different person when he was younger; it's an fascinating thing to see. The Son. Unfortunately, this novella wasn't particularly interesting either, but I think - don't quote me on this - that we get our first look at Tris through Four's eyes, which means my ears definitely perked up a bit when reading the novella. It was only a tiny piece though, so I'm not sure if I really gained much from it. The Traitor. I actually found this story particularly interesting, as it becomes more obvious that Tobias views himself so much more differently than Tris does. In fact, looking outward from Tobias's head, Four seems like a regular, plain old guy. Not particularly brave or good-looking, just a guy. It was kind of shocking, actually. However, it was very interesting seeing the plan to destroy Abnegation starting up, and a lot of things that happened in Divergent are finally explained in this novella. I kinda loved this one. And of course, TRIS. The Three Exclusive Scenes. These scenes were hands down my favorite part of this book, as they were all scenes from Divergent where Tris and Four had moments. 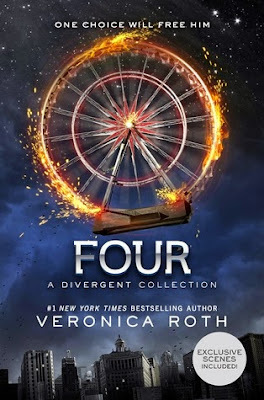 Veronica Roth, the author, chose some scenes that Divergent fans will always remember, so it was really nice getting to see the occurrences from Four's perspective! Overall, this book is a great read if you're in-between books and/or simply want some more time with Four. On its own, the story collection isn't anything special, but if you're a huge fan of Divergent, then what are you waiting for? Book Synopsis: Two years before Beatrice Prior made her choice, the sixteen-year-old son of Abnegation’s faction leader did the same. Tobias’s transfer to Dauntless is a chance to begin again. Here, he will not be called the name his parents gave him. Here, he will not let fear turn him into a cowering child. Source: Borrowed the book from the school library.